A graduate of Villanova University, John formed the band in 1993. 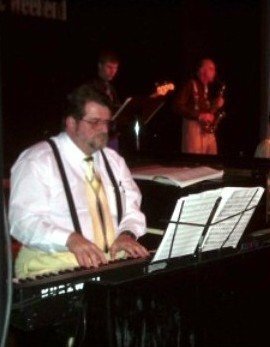 Prior to the John Hoey Orchestra, John has worked for Royal Caribbean cruise lines, the Downingtown Inn, and many theatre productions around the country. As a former member of the Glenn Miller Orchestra, and the Russ Morgan Orchestra, John brings his experience of the traveling musician to the local band business. John has been an advocate of the swing music style and the music of the 60's & 70's for most of his musical career. Brian came to the band in the summer of 2000 after finishing the national tour of "Annie". Brian can also be heard on 3 CDs with the recording artist "The Mighty-Mighty BossTones", including their RIAA Certified Platinum-selling recording "Let's Face It." In addition, Brian has performed with many artists over the years including Bobby Vinton, Sting, James Taylor, Oleta Adams, Natalie Cole, Martha Reeves, and Al Martino. He earned a degree in Music Business/Management from the Berklee College of Music. Jan has been a sub for the band for many years, and he is now very happy to be full time with The John Hoey Orchestra. Previous credits include touring Europe with the band of Woody Shaw, as well as playing in the US with groups such as Aretha Franklin and The Temptations. Joe joined the band in the winter of 1999. He is a graduate of The Curtis Institute of Music, and he is also a member of the Philly Pops w/Peter Nero, the Opera Company of Philadelphia, and the PA Ballet Orchestra. His playing styles include, Dixieland, Klezmer, and Big Band Jazz just to name a few. Among his favorite places to play are Carnegie Hall, the Kennedy Center, and the White House. Joe has played for EVERY U.S. President since 1964. If you happen to be at one of our gigs, see if you can name all the those Presidents since 1964 and Joe will play a private concert for you!! Matt comes to the band as a guitar player after doing sound for us for several years. 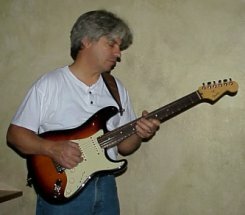 His previous credits as a guitar player include: Only Us, The Montels, Cheers, and Main Street. Rick Anthony joins the band after "coming out of a self-imposed retirement" of 20 years. You may recognize him from his performances of The National Anthem at numerous professional and collegiate sporting events. Rick has been singing the standards to his wife and four children while pursuing his management consulting career. He has given in to his "mid-life crisis" to perform live again. 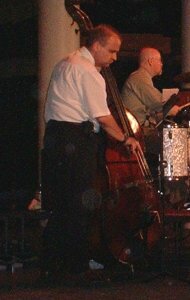 Rick fronted The Alan Lee Orchestra and played the Atlantic City circuit while in college. He enjoys performing the ballad sound, but loves to cut loose on Nelson Riddle and Quincy Jones arrangements. Edd has a Bachelor of Science in Music Education and a Master of Science in Instructional Media from West Chester University. He has performed with numerous local jazz artists such as Larry McKenna, Mike Falcone, Pete BarrenBrege, Wendell Hobbs, Tom Darnell, Norm Manno, and Paul Congdon, to name a few. He is a free-lance composer, arranger, and producer of music for commercial television and educational films. His commercials include McDonald's, Action News, Eyewitness News, Accuweather, Bemco Mattress, and Doors Unlimited. Darrell resides in Brooklyn, NY and has played with the Glen Miller Orchestra, Tommy Dorsey Orchestra, Maria Schneider Orchestra, Roy Hargrove Big Band, and Frank Lacy Vibe Tribe. He also has toured with broadway shows, and currently subs with "The Lion King" and "Les Miserable" on Broadway. Darrell is a alumnus of Rowan University and Temple University. Howie is doing his second tour with The John Hoey Orchestra. He was previously with the band from June of 1999 through September 2000. He had taken leave to be the house bassist at the Walnut Street Theater in Philadelphia. He is a graduate of the University of Arts in Philadelphia.